BONUS SET OF 6 STICKS! 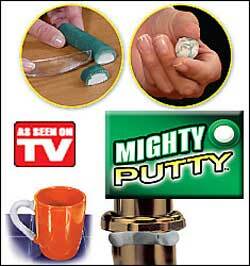 Mighty Putty™ fixes, fills, seals and repairs impossible materials. Greatest super-powered epoxy on the market bonds to last! Seals leaky pipes, fills cracks, repairs steel, aluminum, wood, fiberglass, ceramic, even CONCRETE. Bonds to wet surfaces; molds to any shape. You’ll receive BONUS SET OF 6 STICKS!